It won’t be long when people around the world would start planning their New Year vacations. There is no better way to enjoy vacations than to travel around new places and celebrate the dawning year with friends and family. Tourists flock to tropical beaches to escape the cold spell and relax on warm, clear waterfronts under the glistening sun. However, these destinations are usually filled to capacity during the peak Christmas season, making it impossible for you to book a decent hotel or to avail reasonable travel fares. Celebrating New Year Burj Khalifa is a festival in itself. The amazing fireworks add to the grandeur of the Burj Khalifa that is bedecked with glittering lights. The flanking Dubai fountain brings the evening alive with entertaining water and music show. You can get seated on the special viewing platforms installed in the Burj Park and the breathtaking décor and the celebration evening which culminates with live shows, DJ’s and firework displays. One of the highest-flying luxurious hotels in the UAE, Atlantis, rings in the New Year in its signature style. The hotel is decked up keeping the festive mood in mind. The guests staying in the hotel for the New Year celebration are showered with surprising bonuses. A huge gala dinner accompanied with remarkable performances is organized at night to welcome the New Year. If you want to take a nice walk along the coastline, the 14km stretch of sand along the Kite Beach is the perfect track for you. You can enjoy plenty of beach side activities here. The sidewalk is dotted with high-quality water sports equipment for kite surfing, stand-up paddle surfing, wakeboarding and much more. Don’t want to head to the water? Never mind, you can join lots of new friends to play a game of beach volleyball. For a more relaxing vibe, bask in the peaceful beachside atmosphere while having an amazing view of the magnificent Burj Al Arab. The extensive esplanade in Palm Jumeirah is the perfect spot to view the New Year carnival. Many hotels on the boardwalk offer dedicated viewing areas to watch stunning fireworks that decorate the swanky skyline. The lavish restaurants in the complex dole out the special menu while the pubs and discos organize star nights that keep guests entertained and thrilled on the New Year’s evening. Also known as Black Palace Beach, Secret beach is Dubai’s hidden beach that offers beautiful sandy shoreline with pristine water. This is the best place to unwind and observe the serene sunset as the sky above you twinkles with glittering fireworks. This peaceful beach presents a splendid view of both the Palm Jumeirah and the Burj Al Arab. New Year celebrations can’t get better than this. The delightful location, the friendly welcome and the opulent ambience are matchless. Revelers usher in the New Year with the spectacular fireworks show and the fantastic view of the luxurious Burj Al Arab Jumeirah that adds to the picturesque evening. Well, if water is your calling, a cruise seems a perfect way to start the year. The Dinner cruise offers a unique experience to guests on board by serving delicious food together with fascinating dance performances and live music shows. The tastefully decorated cruise leaves from Dubai Creek. Enjoy the party on the cruise before you continue the festivities on the land as well. If you love to dance till you drop, waltz your way into the New Year at Ras Al Khaimah evening celebration. 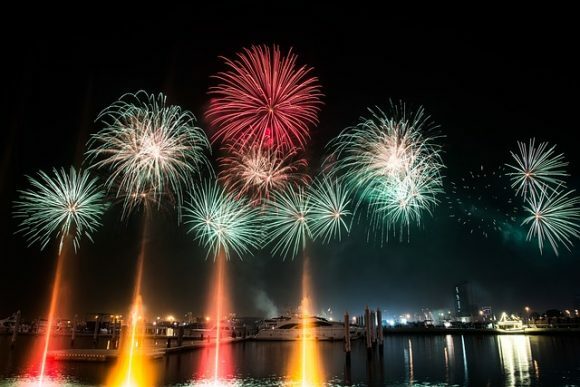 This is one the biggest parties in the UAE on the New Year’s that offers the best spots to enjoy the impressive firecrackers on Al Marjan Island. The party starts late in the evening and rides you through to the wee hours, making the beach party night an unforgettable experience. The legendary performances by world-renowned DJs, local house music and plenty of other surprises make for a thrilling event. Snack up yummy delights from food trucks to keep up your stamina and dance all night. The fancy nightclubs on the island boast panoramic projection mapping, giant animated LED screens, beautiful light shows, an outstanding sound system, and a deluxe VIP area, taking Abu Dhabi’s food and entertainment standards to new levels. Home to the largest pubs and clubs in the UAE, Yas Island offers live music shows, parties, and exquisite cuisines – basically everything that makes the New Year’s night the most joyous experience ever. Al Majaz seafront is a leading holiday destination in Sharjah. Every year, thousands of families welcome the New Year with an incredible fireworks display and the Fountain’s show that keep them enthralled. You can take advantage of the top-notch dining and amusement facilities that flock to the waterfront for the New Year’s Eve. The food and beverages served to the guests at the restaurants which overlook the magnificent Sharjah Fountain fill your appetite and soul alike. Celebrate the New Year in the UAE, far from the deafening noise and hectic life that metros offer. Here, you’ll be greeted with special food, exotic beverages, live entertainment shows, and eclectic firework displays. Visit with your friends and family in tow to make the most of what the country has to offer. You can bag massive deals on accommodation and travel by reserving your deals in time. What’s more, the shopping malls and restaurants offer special perks to make the vacation season even more pleasant for the enthusiastic crowd.